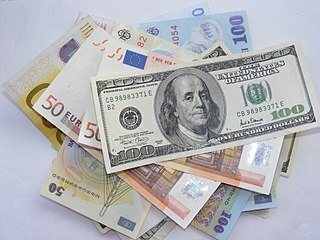 In finance, an exchange rate is the rate at which one currency will be exchanged for another. It is also regarded as the value of one country’s currency in relation to another currency. For example, an interbank exchange rate of 114 Japanese yen to the United States dollar means that ¥114 will be exchanged for each US$1 or that US$1 will be exchanged for each ¥114. In this case it is said that the price of a dollar in relation to yen is ¥114, or equivalently that the price of a yen in relation to dollars is $1/114. Gross domestic product (GDP) is the market value of all final goods and services from a nation in a given year. Countries in Africa are sorted according to data from the International Monetary Fund. The figures presented here do not take into account differences in the cost of living in different countries, and the results can vary greatly from one year to another based on fluctuations in the exchange rates of the country's currency. Such fluctuations may change a country's ranking from one year to the next, even though they often make little or no difference to the standard of living of its population. The KFC Index is an informal guide to measure purchasing power parity comparing exchange rates in African countries. Inspired by the Big Mac Index, the key difference between the two indices is that the KFC Index focuses solely on Africa; the Big Mac Index coverage is worldwide but not as applicable to Africa since McDonald's has little presence there, whereas KFC chains operate in almost 20 countries across the continent.